Taking action to secure a cleaner future. Adelaide Airport acknowledges that the world is heading towards a carbon constrained future which demands that businesses address the various risks associated with climate change and energy. Adelaide Airport’s commitment to managing and minimising carbon emissions generated by operation activities and reducing energy consumption is underpinned by its Low Carbon Statement and Carbon Management Plan. A mature greenhouse gas accounting system forms the foundation of AAL’s carbon management program and is essential in measuring progress against reduction targets. The system was verified by Airports Council International (ACI) in 2013 resulting in Adelaide Airport being the first in Australasia to be awarded certification to Level 1 of the ACI Airport Carbon Accreditation program for mapping its carbon footprint. It achieved another significant milestone in 2015 becoming the first to be awarded certification to Level 3 by demonstrating measurable reductions in its carbon footprint as well as seeking to influence and guide its stakeholders in doing the same. Adelaide Airport is currently below the corporate greenhouse reporting threshold under the National Greenhouse and Energy Report Act 2007. However, AAL is conforming to, and reporting against, ACI’s rigorous accounting standards. AAL’s carbon footprint is being reduced through various clean energy measures. Electricity is mostly consumed by AAL terminal buildings, car parks, offices, street lighting and airfield lighting. AAL is achieving improved energy efficiency through initiatives such as LED lighting, sensor-operated lighting, smart heating and cooling operation and upgrades, and staff awareness campaigns to change energy habits. AAL has also added three full-electric plug-in Nissan Leaf vehicles to its vehicle fleet, as well as investing in more fuel efficient diesel-powered commercial vehicle, to reduce carbon emissions and other air pollutants. 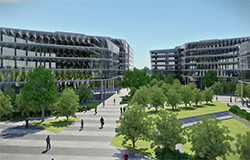 Collaboration is occurring with tenants to employ green leases for ‘green’ infrastructure, such as the upgraded Australian Quarantine Inspection Service building rated to 4.5-star NABERS and the new Australian Federal Police facility which is rated to 4-star Green Star and 4.5-star NABERS. In an ongoing effort to minimise energy consumption, AAL will continue to identify and implement cost-effective energy reduction projects, expand the preventative maintenance program in alignment with development; educate employees on energy efficiency practices; and identify opportunities to increase renewable energy generation onsite. As a significant quantity of energy consumption is under the direct control of various airport businesses, AAL will continue to guide and influence stakeholders on energy efficient practices and encourage the adoption of clean energy principles.